French, late 17th- or early 18th-century maroon morocco with green (now faded to blue) morocco doubleurs. Gift of Mrs. Charles Wrightsman, 2002. Patrick and Elisabeth Sourget, Mrs. Charles (Jayne) Wrightsman. 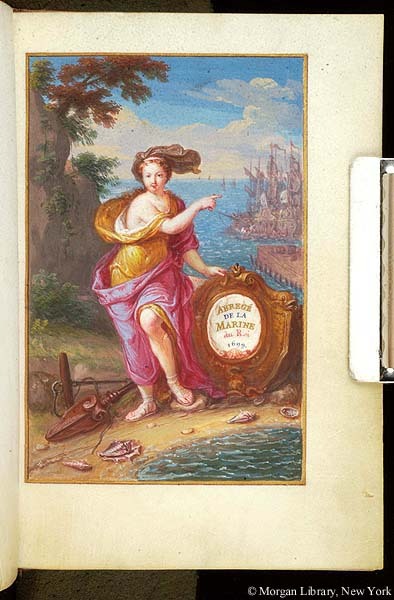 Ms. account of Louis XIV's navy; written and illuminated in Paris, signed and dated by the scribe, Charles Gilbert ("Gilbert scribebat 1699"). The ms. may have been composed for Michel de Chamillard, who succeeded Colbert in the office of Contrôleur upon the latter's deat in 1683. Information includes: general list of vessels; vessels under construction; list of naval officers with number and grade; list of vessels and officers in the colonies; list of vessels at port; comparison of naval artillery for the years 1661 and 1699; list of classes of sailors; general list of galleys and their officers; state of the vessels and other merchant ships in all of the departments beginning in 1699. Decoration: calligraphic manuscript written in red, blue, and gold ink; 1 miniature; multiple charts and tables.